The possible discovery of a pair of recently erupting ice volcanoes on Pluto are among the unexpected “astounding” findings just unveiled by perplexed scientists with NASA’s New Horizons spacecraft, barely four months after the historic first flyby of the last unexplored planet in our solar system. “Nothing like this has been seen in the deep outer solar system,” said Jeffrey Moore, New Horizons Geology, Geophysics and Imaging team leader from NASA Ames Research Center, Moffett Field, California, as the results so far were announced at the 47th Annual Meeting of the Division for Planetary Sciences (DPS) of the American Astronomical Society (AAS) this week in National Harbor, Maryland. “The Pluto system is baffling us,” said mission Principal Investigator Alan Stern of the Southwest Research Institute, Boulder, Colorado, at a news media briefing on Nov. 9. Two large mountainous features tens of miles across and several miles high, have been potentially identified by the team as volcanoes. 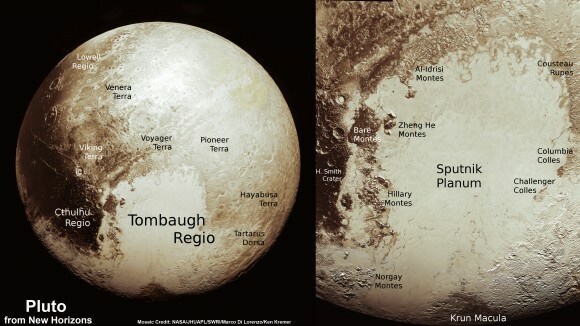 They were found in terrain located south of Sputnik Planum – a vast area of smooth icy plains located within Pluto’s huge heart shaped region informally known as Tombaugh Regio. It may have formed very recently resulting from geologic activity within the past 10 million years. The possible ice volcanoes, or cryovolcanoes, were found at two of Pluto’s most distinctive mountains and identified from images taken by New Horizons as it became Earth’s first emissary to hurtle past the small planet on July 14, 2015. “All of our flyby plans succeeded,” Stern stated at the briefing. “All of the data sets are spectacular. Scientists created 3-D topographic maps from the probes images and discovered the possible ice volcanoes – informally named Wright Mons and Piccard Mons. Wright Mons, pictured above, is about 100 miles (160 kilometers) wide and 13,000 feet (4 kilometers) high. The erupting Plutonian ices might be composed of a melted slurry of water ice, nitrogen, ammonia and methane. “These are big mountains with a large hole in their summit, and on Earth that generally means one thing—a volcano,” said Oliver White, New Horizons postdoctoral researcher with NASA Ames, in a statement. The team is quick to caution that the “interpretation of these features as volcanoes is tentative” and requires much more analysis. More than 50 papers about the Pluto system are being presented at the AAS meeting this week. So far New Horizon has transmitted back only about 20 percent of the data gathered, according to mission Principal Investigator Alan Stern. “It’s hard to imagine how rapidly our view of Pluto and its moons are evolving as new data stream in each week. As the discoveries pour in from those data, Pluto is becoming a star of the solar system,” said Stern. Stern says it will take about a year for all the data to get back. Thus bountiful new discoveries are on tap for a long time to come. With 20 percent of the data now returned and more streaming back every day, the team is excited to debate what is all means. No wonder the planetary scientists are “astounded” and baffled by these findings. They are very similar to the “volcanoes” found on Jupiter’s moon Io. These were proven to be electrical/plasma arc discharges. Until planetary scientists begin to account for the forces of electromagnetism in their models of the solar system they will continue to be baffled and astounded. Considering a different viewpoint would have to be less painful than this continued and embarrassing support of a failed gravity based standard model. What are you on about? When did anyone ever even claim they were electrical discharges, much less “prove” it? The volcanoes on Io are not electrical discharges. They are sulphur volcanoes, powered by tidal heating of Io’s interior. Spectroscopy shows that the plumes contain sulphur, therefore they cannot be electrical discharges. First, lead investigator Chris Hamilton noted the perfect umbrella plumes reaching 190 miles high which were confirmed to be filamentary in nature by the Gallileo probe. No volcanoes known erupt in this fashion. The ejected material dropped back to the surface in beautiful rings. This has also never been observed from a volcano. This led leading astrophysicist Tommy Gold in 1979 to publish a paper in Science stating these “volcanoes” on Io were the product of electric arcs striking the surface. All of Gold’s predictions based on his observations were subsequently validated; 1. The outbursts should be repeated systematically. 2. They would be very hot in the small areas struck by the arcs rather than large areas of slightly raised temperature. 3. They would be visible at night due to the release of visible light. Further confirmation was obtained when data obtained 10 years later from subsequent missions showed the source of the eruptions had moved almost 75 miles from the initial positions. So please, get your facts straight. NASA and current astrophysicists have been ignoring the overwhelming effects of electromagnetism despite data to the contrary. The literature is full of documentation but the “establishment” is relying on individuals such as yourself to follow the party line and relinquish their right to think for themselves. The formation of cryo-volcanos on Pluto closely following evidence of liquid water flowing on Ceres, geysers on Enceladus, aquifers on Mars and… whoa! Is it starting to make sense yet? Time to ‘bone up’ on cryogenics and their properties? It’s ‘funny’ how in a fractal way the cryogenic liquids and ices we assume to have ‘boiled up’ from below, forming the volcanoes, mimics or behaves similarly to earthly lavas and magma chamber formations? Apparently it’s not extremely high temperatures that drive magmatic flows on these icy worlds. Instead it appears to be driven by critical triple point temperature and pressure gradient variations? H2O4U….You make some very valid points and may be totally correct. I’m not ready to make the leap that ‘cryogenic liquids and ices” mimic the behavior of lava or any volcanic process. Whether pressure and temperature gradients account for these formations remains to be proven but is a credible hypothesis that should be evaluated. The use of the term “ice volcano” just elicits a totally negative reaction in my grand unified theory of what makes sense……..lol. 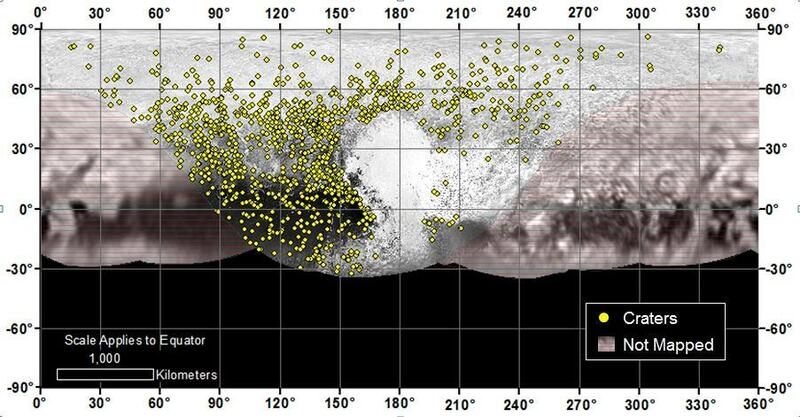 I have elucidated on the published information and data obtained from the Gallileo mission regarding the “volcanoes” on Io which precipitated my comments. These are clearly electromagnetic phenomenon. The conditions on IO are clearly different from those on Pluto but their definition depends on independent thinking such as yours. Yes there are clearly electro dynamic influences in space that we have yet to fully explore. EM theory is DEFINITELY part of the equation, especially in the next universe over? Our tenuous steps outward have only just begun to open eyes to low temperature physics! Isn’t that why we went? One notable effect in some cryogenic materials is that they can become superconducting. This has ramifications for the formation of solid bodies in our solar system. How to build a comet? Tribo electric attraction anyone? Got condensed high speed E/M wave fronts from Sol to pump up your electrons? Does that sound attractive? Next PostNext Who Was Sir Isaac Newton?